About eighteen months ago, I attended a Bookshop Barnie at Foyles, a splendid series of literary events run by my friend, razor sharp journalist and teacher of things architectural Austin Williams. The book being discussed was Made in Britain and its author one Mr Evan Davis, was there to present the case for his tome and field questions and comments from the floor. A hunch that the place would be packed proved correct, but I arrived early for my front-row seat and was happily introduced to the man himself by Austin. Naturally, I lost no time in showing him the Peezy kit that is ever present in my handbag. I suppose it’s not every day a gentleman is presented with a mid-stream urine collection system by its enthusiastic Manufacturesse although, being Made in Britain, Peezy was apposite to the book in hand. He certainly didn’t seem to mind, indeed seemed very interested. I suppose that’s why he remembered. Yesterday then, with butterflies abounding and peddles fixed firmly in the crook of my shiny patent peep-toe heels, I cycled away from Old Street to Millbank where the filming was taking place for as well as two slots on Radio 4, The Bottom Line goes out on the BBC News Channel, World News TV and the World Service. It was a beautifully warm, sunny day, not a breeze to ruffle my freshly curled coiffure (thank you Damian) and I sped through the remarkably quiet streets arriving some half an hour early. The beautiful Victoria Tower Gardens seemed like a good spot to calm myself, gaze at the river and the Rodin sculpture that resides there, cool down after the ride and, well, have a word with myself. My destination was a corner building that has always held a fascination; it looks out to the river with a quietly ornate façade. Slowly mounting the stairs I gazed at the high ceilings, the gracious spaces, the delicious unapologetic, dignified grandeur. And I felt very lucky. Entering the BBC News reception, smiling friendly people with earphones gave a warm welcome and spun me through rooms colonised by long desks, and seemingly millions of faces looking urgently into millions of flickering screens, to the Green Room. 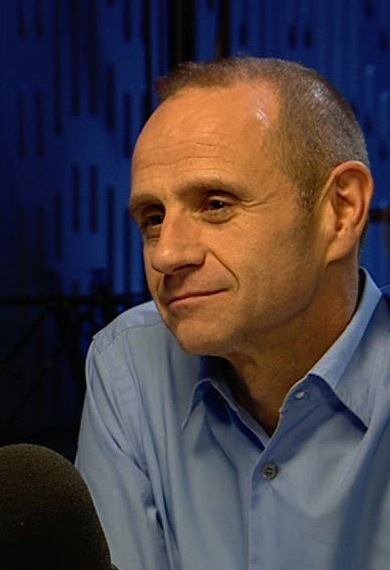 There was Evan Davis looking immaculate in his trademark blue shirt (whoever irons it deserves a medal; I spent much time immersed in scrutiny, failing to find so much as the teeny tiniest creasette; even my Swiss-German Mother would be impressed and I could compose a whole other blog on her ironing standards). There in the Green Room, I met fellow guests, the handsome and talented Jim Eyre, of globally acclaimed Wilkinson Eyre Architects (I have long been a fan so this was very exciting) and the piercingly clever Dr Uwe Krueger, CEO of Atkins one of the biggest design, engineering and project management consultancies in the world. Producer Helen Grady, smiling, professional, with an unswerving attention to detail (her briefing had been utterly thorough) organised coffee and generally put me at ease. Before long, I was whisked away to Make Up. Seating me in front of a very bright unforgiving mirror, Make-Up set to work with foundation and … well, the detail is something of a blur because this black art involved a great deal of opening and closing of eyes and a tale of how Evan had been showing Peezy to the women in the studio, seeking their opinions. Luckily, I heard, they were very positive. Certainly Make Up was onside; thank you Mr Davis. Before long and sporting the (very flattering) cosmetic version of Photoshop I was escorted to the Studio and here, dear reader, the action began. I was positioned as the proverbial rose between my two unthorny peers, the three of us facing Evan, who ran through the format, what we should and shouldn’t do … “Please try not to bang the table, the sound is picked up really easily.” Inevitably, we all had our table-thumping turn during the two-hour session. The experience thereafter was surreal; Helen had recommended I think of the session much like a dinner party, where discussion is free and flowing. Given the import of the event I had my doubts but indeed, it felt very much like a friendly occasion thanks to Evan’s easy charm and gentle direction, sometimes using the flicker of a hand to suggest a pause, a tiny smile of encouragement perhaps, the occasional something to make it all come together beautifully. Around us in the dark, I was aware of cameras rolling, of silent figures capturing every expression, eyes missing not a detail, ears picking up every intonation. I wondered what they would keep in, cut out, magnify, fade. If Make Up is a black art, then Programme Making is sheer wizardry, and the Wizards calm, professional, kind … and inscrutable. Things went very smoothly, there was an easy camaraderie between us; we liked each other and although my world is very different to theirs, my fellow guests, led by Evan, made it easy for me break in, to be very much part of what I feared would be a discussion dominated by bigger business matters than I have yet to encounter. But I learned that our experiences chime and that scale matters not. We all run businesses that flourish, that will continue to flourish because each of us is very good at what we do. That, I suppose, is why we were there and I have come to understand that Forte Medical is not just good, but brilliant. The company is unique, smart, nimble and yes, rather pushy. We have to be to achieve our goal, for within a year from now we will have changed something radical within healthcare, replacing mediocrity in medical analysis and patient care with a new gold standard. Of this, I am convinced; how I will feel with mission accomplished I cannot imagine. Without further ado, I will leave you to judge for yourselves the outcome of my happy afternoon at the BBC. Broadcast media is virgin territory, and I have no idea what will transpire … so with an intake of breath, I give you, The Bottom Line. This entry was posted in Business, Life and romance, London, Uncategorized and tagged Atkins, Austin Williams, BBC, Bookshop Barnie, broadcast, cameras, Evan Davis, Forte Medical, Foyles, Future Cities, Giovanna Forte, Jim Eyre, Made in Britain, make-up, Millbank, Peezy, studio, The Bottom Line, Uwe Krueger, Victoria Gardens, Wilkinson Eyre. Bookmark the permalink. WOW ! Congrats I look forward to listening tomorrow!